Our friend Harish had asked about hourly time cycles of Nifty and whether we could use them for trading. We definitely can! Cycles are as valid in shorter time frames as they are in longer time frames. However, they are less stable than the longer cycles and so we should use them with other technical tools. Red lines represent 147 day cycles and blue lines represent 81 day cycles.These have been plotted from a previous significant low. Significant lows are when several cycles bottom out together. Thereafter based on the influence each is subjected to, they move out keeping in phase with one another. We can see how, near an important low, both the cycles came together.In fact the rally which occurred after that August 08 low, took every one by surprise, in its aggressiveness,With this cycle info, we could have traded the rise confidently. 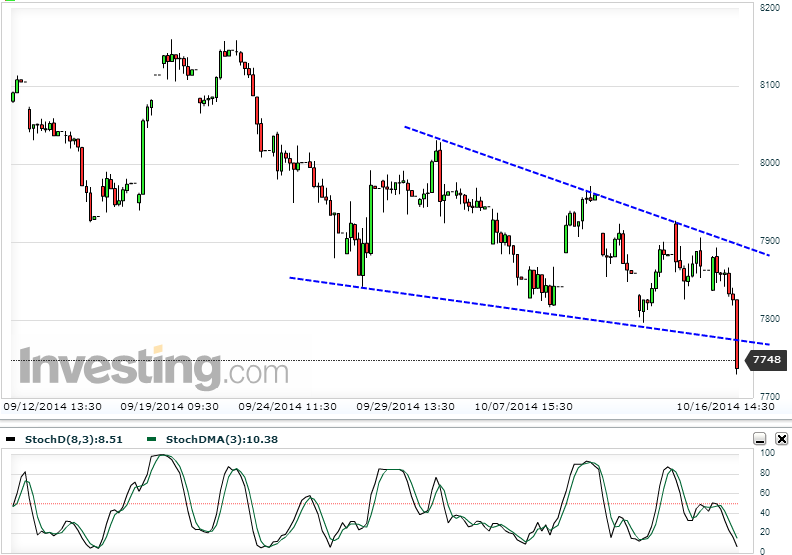 Sometimes we see the market lows forming just after the cycle lines or before them. That is where we se other technical tools to understand the movement better and time ourselves. I have measured here the cycle displacements by those small, coloured rectangles. The rectangles and the bars are more visible here.From the left rectangles, we infer that the red cycles were 18 bars late and the blue cycles were 18 bars early. The next blue circle is due within 8 bars.That means another market low is due by eod tomorrow or, the blue cycle is early by 8 bars and the market bottomed out today.In other words, the late phase of 18 days has been reduced to 8 days.This is only a possibility. To narrow down our choices, we look at other technical tools..
Nifty has broken out of the downward sloping channel and closed below it. So some more weakness is indicated.Hourly momentum is oversold but has not bounced yet.So we wait for a strong reversal signal. That would also mean one of the cycles has bottomed out and it is time for going long. But only after we get a reversal confirmation. Or else the market could still go down.Any which way, since the cycle is due within 8 bars, ( 1 day), we should know in a couple of days. The longer red cycle is due between Oct 23 and 26. So between tomorrow and October 23, we may expect a top. If the top takes time to form, then we are going much higher. If the top is formed within 18 bars, then we will be going down further.Which means it would be time to short the market. In the further right side of the chart, we see one of the blue cycles bottoming out on November 03. 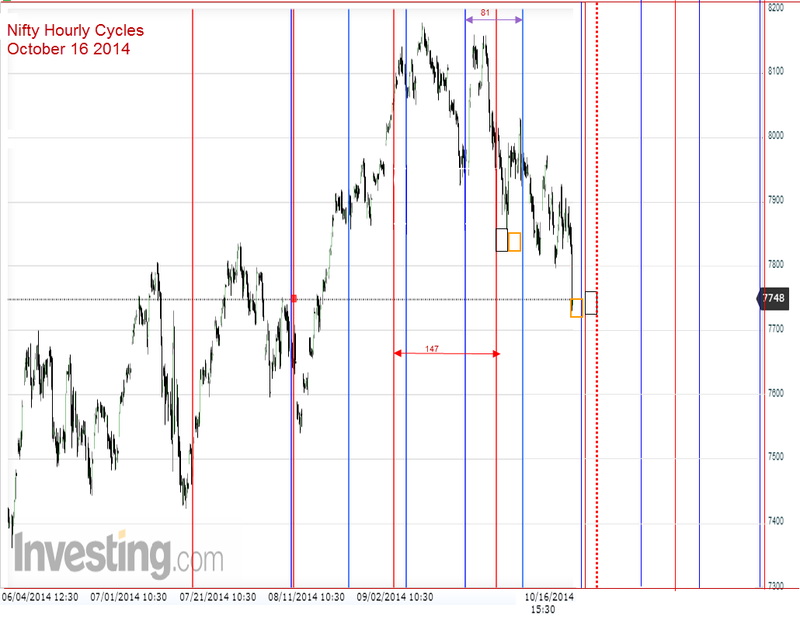 Remember in an earlier post I had mentioned the possibility of a daily cycle bottoming out by November 03 to 06th? That could be a good low. Astrologically, we are in the mid period of Mercury retrograde.So a trend change is possible. Tomorrow, retrograde Mercury meets his Master, the Sun.We will be on the 7th trading day after Venus squared Pluto.There is potential for a low. Rest, of course is in the hands of Lord Shiva. Having broken 7785 on a closing basis for the second day in a row, where your initial premise was not below this number , Has it changed your view on Nifty long term post dated Monday, October 13, 2014, where in you expected a few more months of upside and top out in Jan 2015. Eagerly awaiting your week end post. Please see the new post on Neo wave counts. Thanks lot for your guidenc and explanations of use of hourly time cycles in trading.Please guide more when you have time and correct me if my reading is not proper: Horly Time Cycles consits of 5 cycles (1) 81 Bars (2) 57 Bars (3) 37 Bars (4) 18 Bars (5) 8 Bars. of which 81 & 57 Bar cycles individually includes 18 Bar Cycles inside.81 Bar cycles does not include 8, 37 & 57 Bar cycles as starting Bar cycles of these periods starts 1st before than end inside biggest cycle.Clearifications required. (1) 8 Bar cycles inside of 37 & 57 ?,(2) You wrote 8 Bar (1Day ), but all softwares provides 7 Bar in one day.So is there diffirent systme to count Bars in Time Cycles of one day ? Guide please. (3)From where and how to find out starting of 1st Bar of various cycles. (4) Which Time cycle has maximum influece on top/bottom.Any additional suggestions which you feel important to remember.Please take your own time to explain. I had used only two cycles 81 and 147 days. That as I have explained is actually an approximation of 80 bar cycles. We will increase the number of cycles as we go along.Please see today`s post also and let me know your understanding. Iam using one bar extra per day to compensate for the additional volatility of the hourly cycles.Larger the cycles, more influence they will have on the prices. Only bottoms can be measured this way. Tops have to be analysed using the right, left translation methods I have shown on the Dow weekly chart.Daily cycles will have big influence on the hourly cycles as well.In due course we will identify the monthly, weekly daily and hourly cycles and look at the hourly impacts. That should give us good understanding for practical use. Iam aware and acquainted with Mr. Merriman.He is a senior and well respected astrologer who had been a trader before. His expertise is in Sayana based astrology along with astro cycles. He does not use Rahu and Ketu much in his analysis.Impact periods of his aspects, what we call orbs, are sometimes too large for comfort.His social commentaries make interesting reading.Our style is kp based and is indianised to suit Nifty trading. For us, Rahu and Ketu are very important. We sometimes use sub lord theory in our analysis.